Best rated San Francisco Tour Companies List. Find here a comprehensive list of tourist guides and tourism companies based in San Francisco, California. The Great Pacific Tours Co.
San Francisco Bay Area tour company. Tour packages includes “San Francisco City Tour”, Muir Woods and Sausalito Tour, “City Tour + Muir Woods / Sausalito” tour, Wine Country Tour, Carmel and Monterey with Lunch. Other services includes – personal mini van / Private Charters, Escorts / Translators, Private Airport Transfers etc. Great Pacific Tours San Francisco offers tours in many languages including English, Deutsch, Espanol, Francais, and Italiano. San Francisco tour company offers variety of tour options including small group tours. Tour packages are – Muir Woods & Wine Tour, Yosemite in a Day Tour, San Francisco City Tour, Muir Woods and Sausalito Tour etc. One of the popular tour company in San Francisco for Sightseeing tours. Package tours are Grand City Tour, Napa and Sonoma valley wine tour, Muir Woods / Sausalito tour, Twilight Evening Tour, Grand City Tour with Alcatraz, Monterey and Carmel Tour etc. Big Bus Tours San Francisco offers – Hop-on, hop-off sightseeing tour of San Francisco – 48 hours and 24 hours, 2 hour Panoramic Night Tour of San Francisco, Hop-on, hop-off sightseeing tour of Sausalito and 48 hop-on, hop-off sightseeing tour and trip to Alcatraz. Tours : Napa and Sonoma Wine Country Tour, Alcatraz and San Francisco City Tour, Alcatraz and San Francisco City Tour etc. Hop-on hop-off tourist bus service. Supports 6 languages tour guide service – Japanese, French, German, Italian, Spanish and English. Tours are – San Francisco City Loop, Scenic Night Tour Loop and Sausalito Loop. City Sightseeing offers a wide variety of San Francisco Tours and have the most Hop-On Hop-Off stops. Tours cover all of the most popular areas, including the Golden Gate Bridge, Chinatown, Fisherman’s Wharf, Golden Gate Park, Sausalito and much more. View All San Francisco Tours, Price and Details. Eco. friendly local tour company in San Francisco. Tours packages are “The Real SF Tour”, The Real Golden Gate Tour, The Real Downtown Tour, The Real Metro Tour and The Real Private Tour. San Francisco trip company Dylan’s Tours offers small group minibus and bicycle tours through San Francisco, Muir Woods, Sausalito, and Alcatraz. Tours are – Dylan’s Famous Tour, A day in the Bay, City & Sausalito Tour, City loop e-bike tour. San Francisco trip company operates public tours in NYC, DC, San Francisco & Chicago. Museum Tours for Individuals, Private Groups & Company. Tickets available for de Young Fine Arts Museum : Un-Highlights Tour, 2 hour Museum Hack tour, Museum Hack’s Beta Tours. 50 Hagiwara Tea Garden Dr, San Francisco, CA 94118. +1-800-210-9676 (for private & corporate tours). One of the leading tour operator company in San Fransisco. Member of SF Travel Association and other travel related organizations. 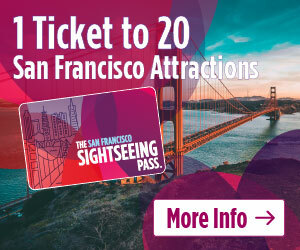 Offers trips to Yosemite National Park, California Wine Country, San Francisco City, Muir Woods, Monterey, Alcatraz, San Francisco Bay (Cruise tour) and more. Tour guides available in Chinese, French, Spanish, Korean, Portuguese, German, Japanese, Italian and English. San Francisco Bay Area tour operator. Offers custom private and small-group tours via luxury SUV vehicles and deluxe Vans around San Francisco Bay Area and Northern and Southern California as well as to Nevada, Arizona, Colorado and Utah. Supports more than 10 languages including German, French, Chinese, Italian, Japanese, Russian, Korean, Spanish and more. Offers USA Vacations, Canada Vacations, Group Tours etc. San Franciso office offering outbound tours (USA to China).